Newspaper articles written by film star Errol Flynn documenting his last years spent in Cuba with Fidel Castro's rebels have been unearthed in a university library. Mention the name of Errol Flynn, and an image of a larger-than-life, swashbuckling screen hero comes to mind. Or the sly grin of a sexual athlete who sparked the saying: "In like Flynn." But towards the end of his life, Flynn was at the epicentre of Fidel Castro's Cuban revolution. It was a surprise to discover the famous actor moonlighted as a newspaper correspondent who wrote a number of articles about his adventures. 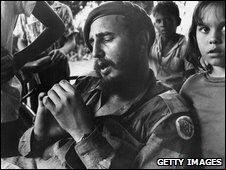 His features "Me and Castro" and "I fought with Castro" for the New-York Journal American remained unread for 50 years, buried in the archives of the University Of Texas at Austin's Center for American History. I have always been a fan of Flynn's films and believe he was a far better actor than he gave himself credit for. 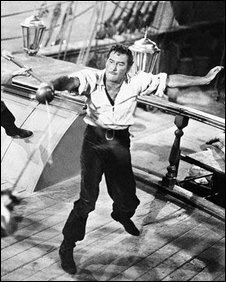 Errol Flynn was cinema's biggest star from the mid-30s until the late 1940s, thanks to his debut in Captain Blood and a series of swashbuckling epics such as The Sea Hawk, The Dawn Patrol and The Adventures Of Robin Hood. But even I was unprepared to find the man who was a screen idol as Robin Hood to a generation of movie-goers in the company of revolutionary pin-ups Fidel Castro and Che Guevara. But, ever the hero, he admired those who fought on others' behalf. I was surprised to find there was a serious side to Flynn - he sympathised with the Republicans during the Spanish Civil War, and set off for Spain "to follow in Hemingway's footsteps" in February 1937. While in Madrid, Flynn condemned the fascist General Franco. He was shelled, survived an aerial attack and narrowly avoided being machine-gunned by an over-enthusiastic Republican. Errol's daughter Rory Flynn said the public image of her father did not accurately reflect the man who wrote two novels, an autobiography and newspaper reports. She said: "It is said that he was a swashbuckling hedonist, but my father was a serious man. "He thought about things, he wrote books, he wrote poems and he wrote documentaries, this is not just something that came about. "He wrote for the Hearst (news)papers. I think underneath it all, he was a journalist." Flynn had been a regular visitor to Batista's Cuba, where the dictator welcomed distinguished tourists, drawn to the island for its brothels and legalised gambling. 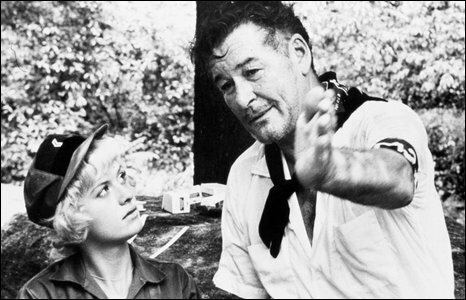 By the time he returned to the country in late 1958 with his teenage girlfriend Beverly Aadland, a lifetime of hard-living had taken its toll, and roles were hard to find - although ironically, during the dog days of his career, Flynn gave two of his best-received performances - The Sun Also Rises and The Roots Of Heaven. Flynn claimed Castro invited him to Cuba at the very dawn of the revolution. Beverly Aadland said: "Errol had talked to Hearst newspapers in New York about interviewing Castro, and through some contacts in the 'Havana Hilton', went up into the Sierra Mistra mountains to talk to Fidel." Beverly was installed at the capital's prestigious Commodore Hotel, while Flynn went off to the mountains with the rebels, spending five days with Castro and interviewing him. In his articles, he described how Fidel Castro told him that "no American knew him or his brother Raul better than I did" and how he gave Cuba's leader lessons in public speaking. Castro is quoted as saying to Flynn: "I feel that the citizens will know who you are... and it will cheer them to know that someone from the United States, whom they perhaps have seen on the screen, is interested enough to come and see them." Flynn also reportedly had a brief encounter with Che Guevara, who did not recognise the bloated and faded film star when they met. In other articles he described gun battles and how he was shot in the leg. He also witnessed Castro's swearing-in as president in February 1959. But Flynn was criticised for spending time with the rebels, and had to defend his allegiances. He wrote: "Ever since boyhood I have been drawn, perhaps romantically - to the ideas of causes, crusades." For a Hollywood actor who has played Robin Hood, could there be any more sort of perfect matchup than Fidel in the mountains fighting against a corrupt dictator? Beverly said she felt he did not realise Castro would go on to be a Communist. "I think he was a hero-worshipper, and I think Errol thought that Castro was a good guy trying to free the country for everyday citizens. I guess Castro fooled him too," she said. Cuban exile and author Carlos Eire said: "At that point when Flynn was there, Castro's policies were purely democratic. His goal was to remove Batista and stabilise the nation politically. "For a Hollywood actor who has played Robin Hood, could there be any more sort of perfect matchup than Fidel in the mountains fighting against a corrupt dictator? "Fidel Castro and his men knew how to work the publicity machine, and there was freedom of the press. "This is one sign of how inefficient Batista's repression was, basically if any foreign journalist or big star like Errol Flynn wanted to go and end up in the mountains, they'd end up there." Flynn was impressed with the vigour of the revolution, and was behind two films made in Cuba at the time. Looking bloated and ill, he starred alongside Beverly in Cuban Rebel Girls, in what turned out to be his final film appearance. But the film was panned as "a truly pathetic swansong to a mighty career" by critics. He also appeared in the documentary he made, Cuban Story, which was a far more substantial piece, and in hindsight, has become one of the key accounts of Castro's revolution. In the last months of his life, Flynn was beset by financial woes and ill health, his third wife Patrice Wymore wanted to divorce him and he was being sued. He died in Vancouver, aged 50, on 14 October, 1959, where he and Beverly had travelled to sell his beloved yacht Zaca to try and pay off some of his debts. Errol Flynn's life was one of contrasts - a star who wanted to be an actor; a legendary hedonist who wanted to be taken seriously as a writer and a man who deliberately placed himself in the heart of two revolutions. Robin Hood and the Cuban Revolutionaries is broadcast on Radio 4 on Saturday at 1030 BST. Why does Robin Hood keep coming back?